Nov. 16, 2015, 2:49 p.m. Hot (financial) takes are coming to Bloomberg. Its newest editorial initiative, Gadfly, launched over the weekend as an extension of the existing Bloomberg View opinions section, with a sizable roster of editors and columnists drawn from other news organizations as well as from within Bloomberg. “Our goal is to provide rapid, smart takeaways on the day’s most important news on markets, finance, companies, and technology,” Bloomberg editor-in-chief John Micklethwait wrote in a note introducing the new section on Sunday. The sleek new site was designed with mobile audiences and social sharing in mind, with a focus on easily digestible charts to illustrate each piece of analysis. It looks a bit like Quartz’s homepage, with stories presented one after the other in an endless scroll. — We see insightful analysis wedded to great writing and the unique, data-mining power of the Bloomberg Terminal as a differentiator in and of itself. — We’ll cover a broader range of corporate, financial and market topics than many of our competitors, and we’ll cover those topics with dozens of columnists on the ground globally. — We’re doubling down in regions like the Asia-Pacific when some of our competitors are pulling back. Great columnists aren’t commodities and we plan to continue stocking up on the best. Quality is a differentiator in a noisy, unfiltered news world. — We’ll try to be closer to the news, and write more promptly off the news, than many of our competitors — though we’ll never sacrifice quality for speed. The “sweet spot” is finding a balance between speed and quality and then targeting the right subject matter. Those are Gadfly’s twin goals. — We take mobile, social, platform development and design seriously and are using those as competitive advantages on the web. Some weren’t quite sure what to make of Gadfly’s approach, or felt it was entering a crowded field. Regardless, Gadfly writers have a major leg up — they can draw on the enormous benefit that is the Terminal (in case you forget, a little tag at the end of those Bloomberg stories reads “Before it’s here, it’s on the Bloomberg Terminal.”) At the moment, all the site’s content is free (and ad-free), but Terminal subscribers get it 15 minutes early. Wang, Shan. "Bloomberg gets into fast financial commentary with its new section, Gadfly." Nieman Journalism Lab. Nieman Foundation for Journalism at Harvard, 16 Nov. 2015. Web. 18 Apr. 2019. Wang, Shan. "Bloomberg gets into fast financial commentary with its new section, Gadfly." Nieman Journalism Lab. Last modified November 16, 2015. 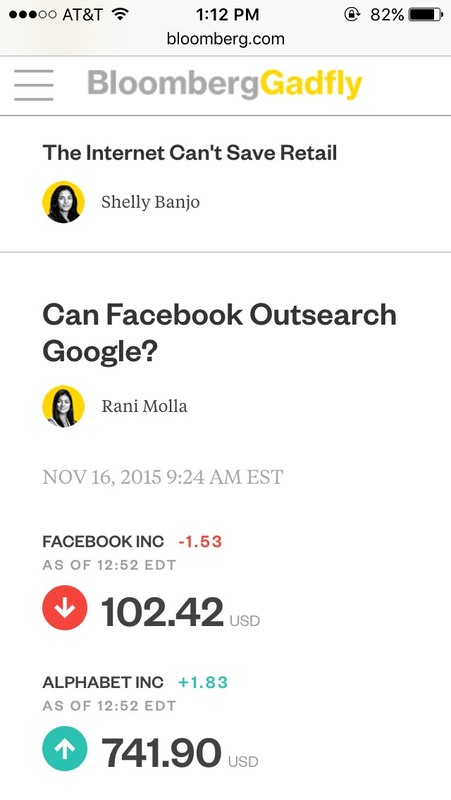 Accessed April 18, 2019. https://www.niemanlab.org/2015/11/bloomberg-gets-into-fast-financial-commentary-with-its-new-section-gadfly/.